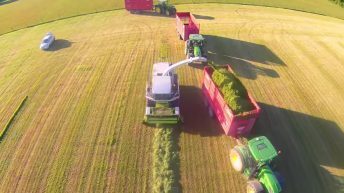 Drone video maker extradionaire Paul Brennan has another amazing silage video. This time, his latest silage video ‘Silage Men – 50 years Gobbling Grass’ is filmed with Brennans of Crossneen. 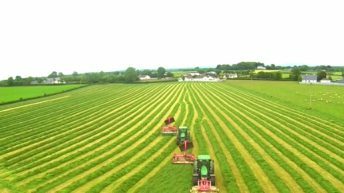 A video featuring Brennan Bros Agri Contractors from Crossneen in Carlow as they harvest silage in Co.Laois. The video features Pa Brennan alongside his two sons Peter and Anthony and his grandson Ricky. This is Brennans 50th year in the agri contracter business as it was 1965 when Pa bought his first hire machine. The video features some of their outfit which are a Claas 870 Speedstar Harvester, JCB 416S Loader, 2 x Kverneland Mowers and 4 x John Deere Tractors. Earlier in the silage season Paul produced a number of other videos using a drone to capture amazing footage of silage making in Ireland. While he only started making the drone videos in recent months, he has amassed a huge following with the footage. “I try to capture that and I get out when the weather suits. I’m an amateur, I only started a couple of months ago,” he said. For anyone thinking of cutting silage this week Met Eireann is predicting a mixed week with showers around the country with some of the best weather to be expected earlier in the week.